LOOKING FOR USED CARS IN ALBUQUERQUE? Zia Auto Wholesalers is the best place to find used cars in Albuquerque, NM. We have a wide selection of domestic and foreign used vehicles and are conveniently located in the center of Albuquerque at Menaul near San Mateo, New Mexico. 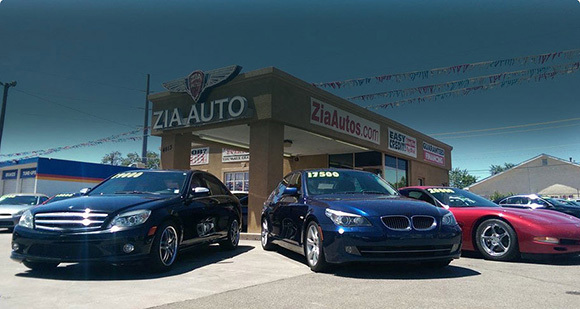 Zia Auto has been in business since 1992 and has sold more than 11,000 vehicles. Our team offers services, warranties and service contracts, and we can arrange financing with low credit union rates or help to re-establish credit for those with credit issues. We have a state-of-the-art NAPA service center that can provide service to all makes and models. Stress Free & Hassle Free Service! Inventory - Find the used truck or used car you want! Service - Honest and professional automotive repair and auto maintenance services to Albuquerque and surrounding areas. Financing Options - Used car financing made easy with our online application. Used Car Locator - If you already have an idea of you are looking for in a used car or truck, ask us to find it for you!